In the meantime you will need an email such as Yahoo, Gmail, Hotmail etc. For AQW read this page and use the form linked on the page or for the Portal/master account read this Make sure you tell them to email you at an email address you currently have access to. Do your best to follow what the page says(if you can't tell them something tell them what you remember if possible) and use your best English so you can get help quicker. If you don't get a reply within 2 or 3 days be free to send another so keeping a copy of what you sent may be helpful. For your email you can try getting in contact with your email provider's support team. Once you have access to your email or the AQW/AE HelpTeam changes your email to one you have access to you can change your password and email as you wish. I want to remove my aqw old account in my AE account and replace it with a new character. My old char is a rouge and I want a warrior for the Omni Knight Blade. But, this is the problem. Are you sure you want to remove the link between your game account "?????" and your Artix Entertainment account? The game account will not appear on your master list of game accounts. Your game account will not be deleted, and can still be used to play. You may lose special prizes on your game account that you earned from mini-games or achievements. Will I lose my Omni Knight Blade here(adventure quest) and my other games in AE account in battleon.com? 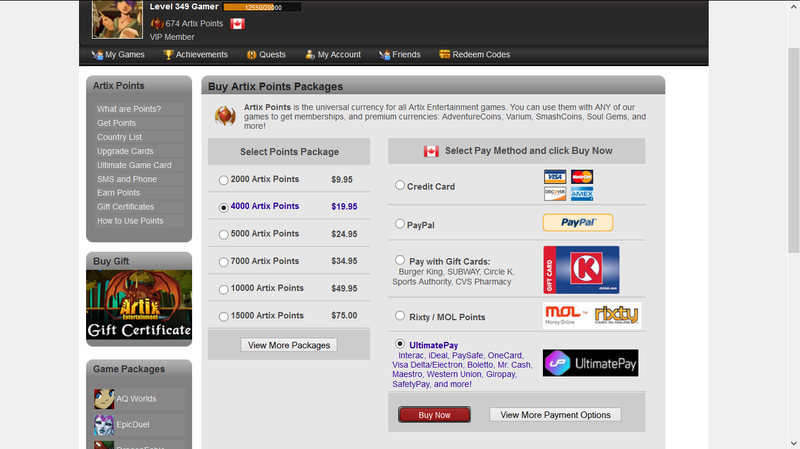 Can you let me know if we can redeem Karma Koin cards to get Artix Points on our Master account? how can i make a credit card payment now that ultimatepay no longer operates? UltimatePay still functions as a third party payment provider. Only UltimatePoints and the UGC went away. These screenshots taken moments ago shows UltimatePay is still functioning, and for credit cards: An option to purchase and still accepting credit cards. i forgot to delete this post sorry thanks though may i delete it? When i use UP (creditcard) it times out? Will i get charged? How can i actually use it? hey is there anyway to redeem my coldstone gift card into artix points? priest_hidan: IIRC, Coldstone cards are not useable for AE-related purchases. You can however check whether AE will accept different gift cards through here (select whichever country you're in). Is the Redeem artix cards system not working? cause I keep trying to redeem a card I have and its not working it goes to the page with next on it but it never says I successfully redeemed it. I know this might be unsolved, but I have linked my dragonfable account, and some other ones, to a master account, but i can't remember what it was. So i made a new master account, but everytime i try to link dragonfable, it says it's linked to the other master account, which i can not remember. Can someone tell me if it is possible for the staff to remove the master account from my linked dragonfable and allow me to relink the dragonfable to my current new master account please? p.s. i can provide proof that the dragonfable accounts are mine. mdx2000: In portal Help & Support use the My Artix Account is Hacked, Stolen or Lost! page. 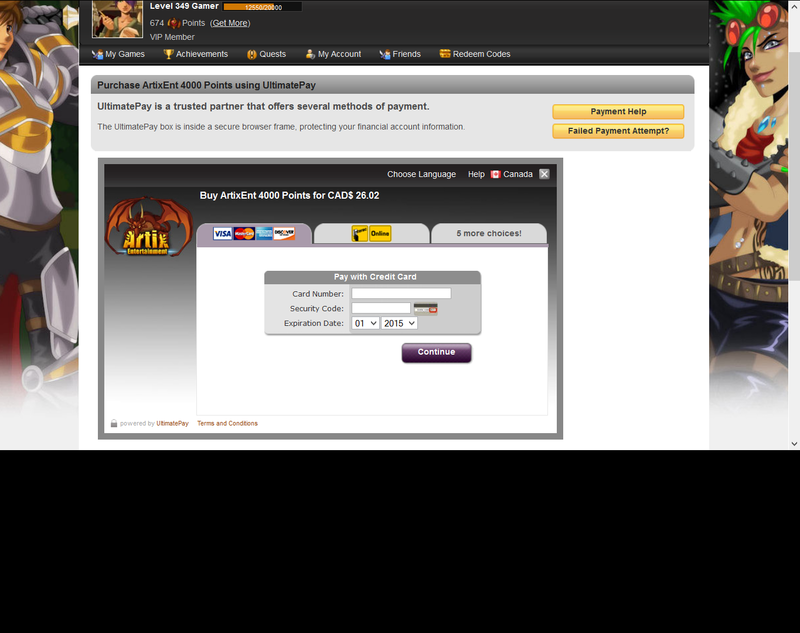 In your message supply all the details needed to identify your DF account (write "unknown" in the Artix Account Name). um but i kinda dont know the email i used, and i haven't accessed it for over a year.. also, i am not sure about the password either, but I can definitely confirm the dragonfable linked account is mine, because i know the username and password. will they still allow me to change the linked account? So I just got my 2016 Calendar code and entered it at aq.com/code. (worked just fine) After playing around with the new items I decided to go onto the portal site to get the items for the rest of the games but it says that the code has already been used for my AQW character(which it has, I understand that) but it doesn't show any other options for the other games and it doesn't "give" me the code on the site. i.e. I have the 2015 calendar as well and I can re-click that code to get items on other games if I haven't already. So my question is how do I fix this/is this a bug? It's possible the calendar rewards for the other games haven't been implemented yet, so the portal recognizes the code has having done everything it should (right now, of course. When stuff gets released, you should try to input the code again and get the rewards. Is there any significance to the level of your master account? I am level 105 but have no clue what that is supposed to mean tbh. As of right now there is no purpose besides something for you to see. There were plans some time ago to use that for something ut many plans have changed for the Master Account system. if my master account gets banned, what happens to the linked accounts? I'm not a US citizen, but I have a google play gift card. Firstly, is Paygarden still accepted as payment? If it's (b), may I request a screenshot of the payment page/location from a helpful soul. We're holding a guild costume contest and I want to award winners with points,but I'm told the codes expire,so I need to make sure. Okay... so.. let me start by just saying this... Linked? How and When ? I just recovered my AdventureQuest WORLDS account a few months ago. coz It was stolen from me while I took a break from the game AQW. and when I tried it Said that " Account Already Linked To a Master Account " Like grrrrrrr I don't even know the email and It's not mine. I want to unlink It but it requires me to log in to that email that I don't even own. Is there a way to unlink it ?